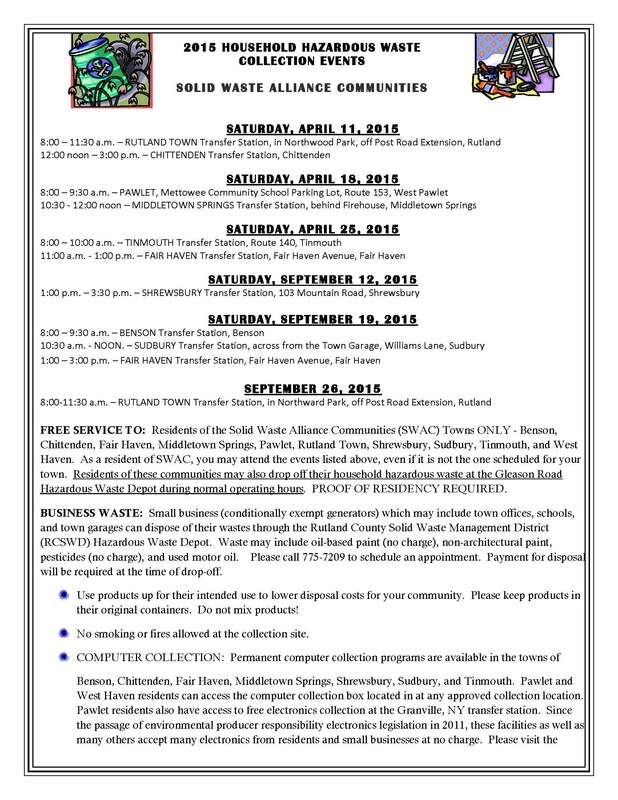 The Solid Waste Implementation Plan (SWIP) delineates how solid and hazardous waste will be managed in the Solid Waste Alliance Communities (SWAC) towns (Benson, Chittenden, Fair Haven, Middletown Springs, Pawlet, Rutland Town, Shrewsbury, Sudbury, Tinmouth, and West Haven) over the next 5 years. The SWIP is available for review on the SWAC website at www.rutlandcountyswac.org. One requirement of the Solid Waste Implementation Plan is for solid waste management entities to survey residents on their knowledge of variable rate pricing, recycling, organics, C &D (Construction and Demolition Debris), HHW (Household Hazardous Waste)/CEG (Conditionally Exempt Generator), and Electronic Waste and Universal Waste. Your participation in filling out the survey would be most appreciated. The survey can be found at: https://www.surveymonkey.com/r/S86DB77. You must have a valid transfer station sticker on your vehicle in order to use the transfer station. Shrewsbury residents may obtain a sticker by sending a copy of their vehicle(s) registration to: Town Clerk 9823 Cold River Road Shrewsbury VT 05738, or at the Town Office. 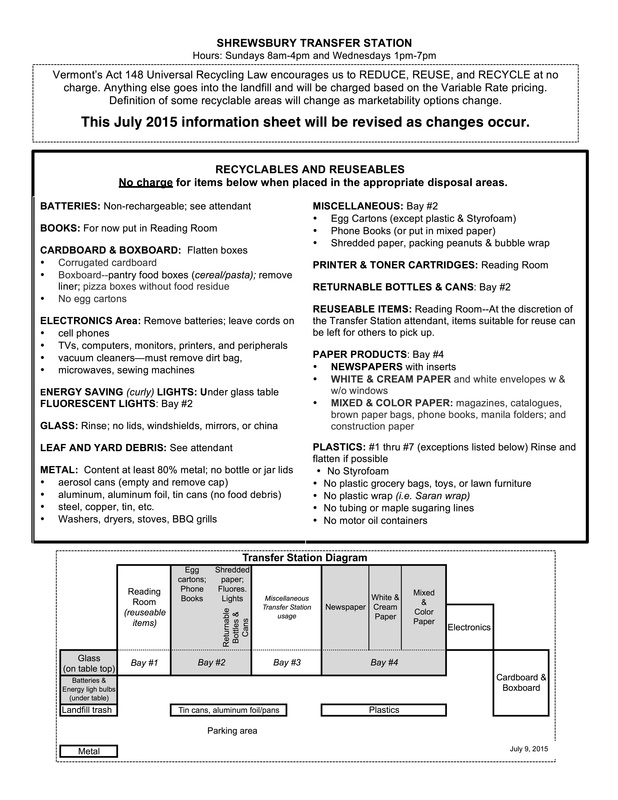 Recycling items are to be deposited in designated spaces provided at the transfer station, separated prior to arrival. Containers of mixed recyclable are not accepted. Please be tidy and clean up. All trash going into the compactor must be in clear plastic, otherwise it may be inspected or refused. Help keep Vermont green and reduce waste with Act 148. The Vermont Department of Environmental Conservation and Solid Waste Management Entities (SWME’s) have been implementing the Universal Recycling Law (Act 148) for the past four years, already banning recyclables from the landfill as of last year. This law will ultimately remove all organics from landfills in Vermont, which will result in a drastic reduction of cost and our carbon footprint. The next stage in Act 148 is to remove organic materials such as yard waste and food waste from the landfills. As a resident, this law means there will be more opportunity to reduce your carbon footprint by separating compostables from trash. By July 1 of this year, all current trash pick-up services must offer separate yard waste collection. While yard waste can already be dropped off by residents at the 130 Mountain School Road transfer station, check with the local trash hauler before leaving yard waste at the curb. By July 1st, 2017, trash haulers and transfer stations will collect food scraps separate from trash as well. As more haulers and transfer stations accept organic materials, it will be accommodating for you to separate food waste from the trash. The final step to implement Act 148 is to ban all food scraps from the landfill by July 1st of 2020. Main goals of implementing Act 148 include reducing waste overall, other than just preventing it from reaching the landfill. Residents have reduced their waste in large ways through meal planning and backyard composting. The food that goes bad in the back of a fridge costs time and money to everyone, but keeping a schedule of what to cook for each day helps reduce costs. Backyard composting will exempt residents from costs of food scrap collection. There will be a Master Composter panel at the Rutland Free Library in the Fox room on Tuesday, June 21st from 7-8:30 PM to help with any questions about backyard composting. 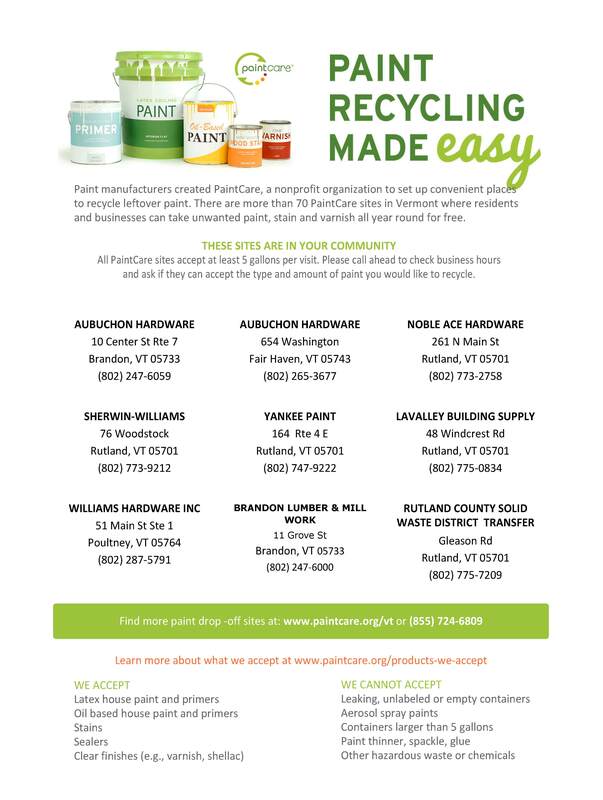 For more information about Act 148: Universal Recycling law, visit the Department of Environmental Conservation’s web site at http://dec.vermont.gov/waste-management/solid/universal-recycling. 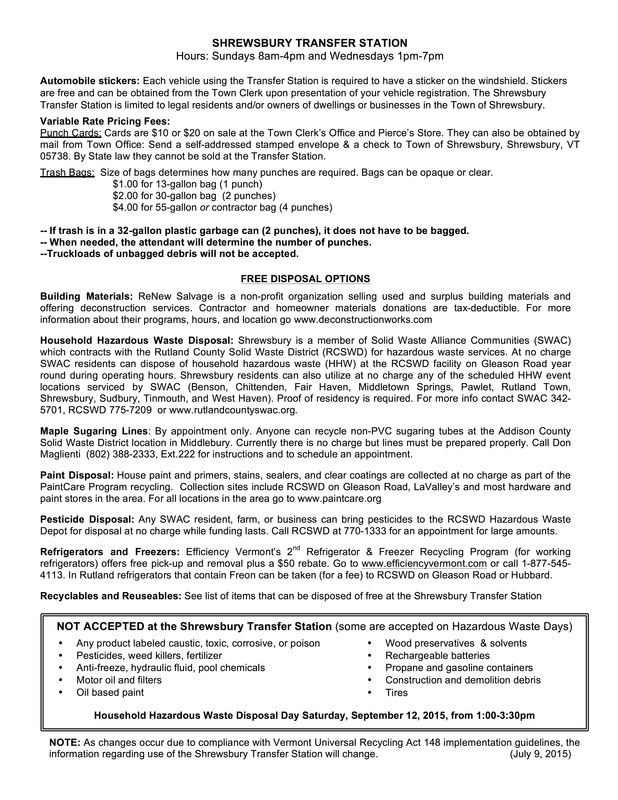 For resources on composting and transfer station materials accepted, contact the Solid Waste Alliance Communities management: visit http://www.rutlandcountyswac.org/, or call (802) 342-5701. It is illegal to burn: paper and cardboard; garbage of any kind; tires and rubber products; plastics and furniture; treated, painted, or finished wood.